We build a comfortable life of our own as we earn more and more the job we are working on. However, it does not mean that whatever property we have is invincible from loss. At some point, it is a must for us to have an insurance in every property that we purchase. Insurance protects these from financial loss. It does not just apply to properties, but also to a person’s life and health. You can also read product manager email signatures. With this, insurance agents look for clients who want to have their lives and properties secured for the future. Most of their clients have families to look out for and some just don’t want to put their property to waste when they die. Insurance agents also need email signatures for easy contacting. The email signature templates that we have collected suit your very purpose. Email signatures are best when you want your prospective clients to easily contact you. In a simple email signature, you put your email address, phone number and social media links, with being the latter an optional thing to do. It also acts as a closing signature to an email, and lowkey telling the client to contact them if they want further information. All of the contact information are compressed in the email signature. The decision is always up to the client’s end. Having a standard email signature is also a good way to promote the business. Most insurance agents work for an insurance company. They have to promote their company in the emails that they send. It helps in creating brand awareness to the clients. Moreover, the bottom space of the email is free, so it’s better to use it for advertising purposes. Whether it’s an email related to your client transaction or not, minimalist email signatures come in handy when you want to get customers. Who knows, the person you are sending an email to needs the service you’re giving? That’s an additional twist when you are meeting a certain number of customers as target. Having a clean email signature is not an exact reflection of who you are as a person. However, it does help a lot when you want to build trust to your clients and want to project your professionalism in the email. It tells the client to trust you because you are professional and capable of taking care of their insurance. There’s no reason why insurance agents can’t have their own email signatures. Big companies also put creative email signatures in their emails. It helps a lot in attracting new customers and getting yourself into the competition. It is important to find the right insurance agent to get your insurance funds started. It all boils down to the fact that the agent can help so much in getting your properties safe. Here are some tips in getting the right insurance agent. 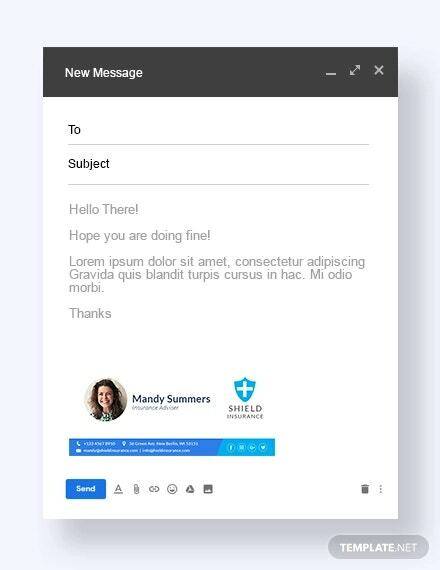 You can also read professional email signatures. Before getting an insurance, know what kind of insurance you want to have. There are insurance agents who specialize in different kinds of insurance such as life, health and property. You need to do some research on the kind of insurance that you’d be getting. Its pros and cons, processes and how much you are going to pay. As long as the insurance suits you well, you can contact agents to help you out. You may also like interior designer email signatures. Nothing is better than word of mouth when it comes to recommendations. Ask your friends to help you out when choosing the right insurance company. You can also ask the payment processes and the kind of benefits the insurance package includes. It is wise to ask three or more people so you can have better choices in choosing the right agent for you. You may also like content writer email signatures. It is also a good option to look for insurance agents online. These people are affiliated to their insurance companies and can do so much in giving you the kind of insurance that you need. Looking for an insurance agent online can also give you their contact information and a little bit of their credentials. All you have to do is do some research and choose the right person to handle your insurance matters. The reviews and complaints of the insurance company and their agents can be found online. You need to weigh in on the choices that you are about to make. Skip a company with poor reviews on them as a whole, and its employees. If you find a suitable company who can give you what you need, consider researching more and get the contact number of the person to get more information about the insurance of your choice. When choosing an insurance agent, you need to consider his years of experience if you want to really know how the insurance system works. You may also see education email signatures. The next thing that you have to do after getting the contact information of the insurance agent is contacting them for a meeting. Agree on a time and place for you to meet. Make sure you show up in the right place and time. The meeting should take place in a venue that is convenient for the both of you. Give off a professional aura when you meet the client. Listen attentively as he explains the processes of payment and ask questions if something confuses you. You can also read business service email signatures. It pays a lot to think of the future while we are working in the present. Everything we have is fleeting and temporary, so it’s better to put them in a safe place in case anything happens. Insurance agents assure us that our properties are never mismanaged by the time we leave this world. You can also read marketing email signatures.